Greenland's glaciers are sliding towards the sea much faster than previously believed, scientists have told a conference in St Louis, US. It was thought the entire Greenland ice sheet could melt in about 1,000 years, but the latest evidence suggests that could happen much sooner. It implies that sea levels will rise a great deal faster as well. Details of the study, by Nasa and University of Kansas researchers, are also reported in the journal Science. The comprehensive analysis found that the amount of ice dumped into the Atlantic Ocean has doubled in the last five years. If the Greenland ice sheet melted completely, it would raise global sea levels by about 7m. Greenland's contribution to global sea level rise today is two to three times greater than it was in 1996. "We are concerned because we know that sea levels have been able to rise much faster in the past - 10 times faster. This is a big gorilla. If sea level rise is multiplied by 10 or more, I'm not sure we can deal with that," co-author Eric Rignot, from the US space agency's (Nasa) Jet Propulsion Laboratory in California, told the BBC News website. Previous estimates suggested it would take many hundreds of years for the Greenland ice sheet to melt completely. The new data will cut this timescale, but by how much is uncertain. "It depends on how fast the glaciers can go and how sustainable the acceleration can be," said Dr Rignot. He added: "It takes a long time to build and melt an ice sheet, but glaciers can react quickly to temperature changes." In 1996, Greenland was losing about 100 cubic km per year in mass from its ice sheet. In 2005, this had increased to about 220 cubic km. By comparison, the city of Los Angeles uses about one cubic km of water per year. Rising surface air-temperatures seem to be behind the increases in glacier speed in the southern half of Greenland since 1996; but the northward spread of warmer temperatures may be responsible for a rapid increase in glacier speed further north after 2000. Over the past 20 years, the air temperature in south-east Greenland has risen by 3C. 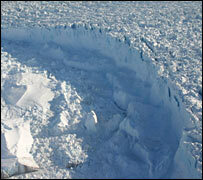 Warmer temperatures cause more surface melt water to reach the base of the ice sheet where it meets the rock. This is thought to serve as a lubricant, easing the glaciers' march to the sea. The study's results come from satellites that monitor glacier movement from space. Rignot and colleague Pannir Kanagaratnam, from the University of Kansas, built up a glacier speed map from the data for 2000 and then used measurements from 1996-2005 to determine how glacier velocity had changed in the last decade. 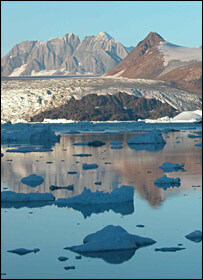 The researchers plan to continue their monitoring of the Greenland glaciers using satellite data. The Greenland ice sheet covers 1.7 million sq km and is up to 3km thick. The scientists described their results at the annual meeting of the American Association for the Advancement of Science.